Whatever your reason for adding a touch of charm to your home, if you know how to crochet the possibilities are endless. Grab some enchanting yarn and your magic wand (AKA crochet hook) and get to work with these 9 patterns! Wooden floors echo and are cold. Carpeted floors are a sea of one static color. Rugs are cozy and can add a much needed pop of color and texture, not to mention they create an excellent focal point for a room. Soften any room with this excellent Cotton Aztec Rug pattern from Elise Engh’s Grow Creative blog. Doilies – lacey things that cover every surface at your grandmother’s house, right? Wrong! Modern (yes, modern!) 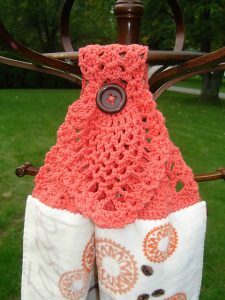 doily patterns do exist, and crochet is kind of in again. 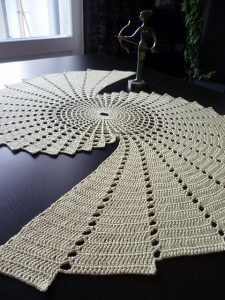 Essi Varis’s Fractal doily pattern is proof positive that contemporary doilies can exist, and that they can be really really cool. Pillows are God’s way of saying “Yes this couch is cozy, but it could be even more comfortable.” No further explanation needed. 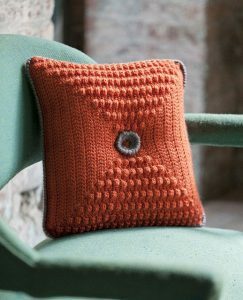 Linda Permann’s Pill(ow) Popper pattern not only provides comfort but also some much needed style to crocheted pillow patterns. Fun tip: opt for a real button in the center instead of a crocheted one. It adds a more polished and finished look to the end product. Oh brother, where to begin. First of all, duh – everyone knows blankets can make even a room made out of ice cubes cozy. Second, how do you even begin to pick out a pattern amongst the hundreds and thousands of patterns out there? 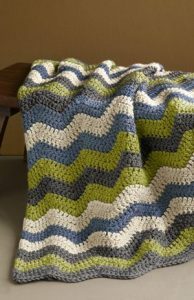 One of my favorite quick and easy patterns is Lion Brand’s Shaded Ripple Afghan pattern. It’s retro, it’s modern, and it’s unbelievably cool. 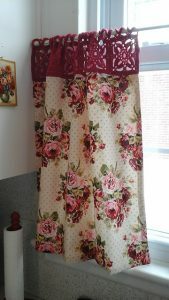 Alice, AKA Yarnstarved, employed some top-notch creativity to make her beautiful Kitchy Curtains. She stitched some crocheted Freesia Squares to the edge of some gorgeous floral fabric to make these cozy curtains. Try it in all white for a crisp and cool accent. Only burn-free hands can keep on craftin’! 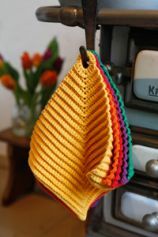 Protect your digits with this classic potholder pattern from Häkel Anleitung. Note: You may need to employ Google Translate if you’re solely an english speaker. For those who don’t know, poofs are super cute versions of ottomans and are basically teeny, firm bean bags for your feet. 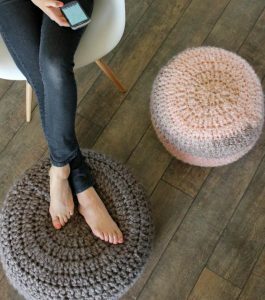 However, poofs are much much cuter than ottomans, and instead of dropping a cool Ulysses S. Grant on one from World Market, check out this quick pattern from Jo-Ann Fabric and try your hand at making your own. Terra cotta is most certainly in, however that particular earthy shade of orange doesn’t go with every decorating scheme. 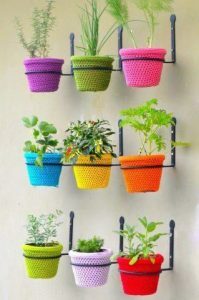 If you find your current decorating style doesn’t mesh well with orange, try yarnbombing your planter with any color of your choice! No pattern here – just some excellent inspiration. Kitchens can use all the coziness they can get (well, at least mine can). 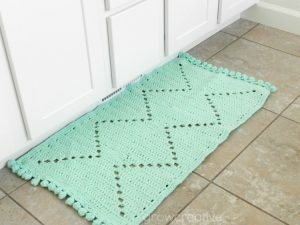 Show your oven handle a little love by crocheting a cozy hand towel edging to an old kitchen towel you have lying around. Heather Holland’s Pineapple Towel Topper is a great start for beginners, and crochets really quickly so none of your old towels have to go without a little pizazz.